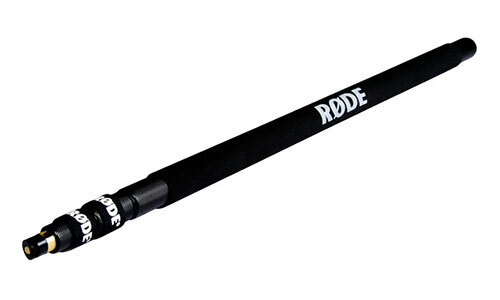 The RØDE Mini-Boompole is an aluminum boompole that manages to stay lightweight due to it’s smaller size (33″ compact). Extending its three sections via a twist to un/lock will allow you to get it up to 81″. Affordable and compact, the mini boompole comes with velcro straps as running a cable internally is not a viable option with its small stature. Though, it does have machined channels at both ends where permanent internal cable could be installed if you are working with 1/8″ audio cable. The first/bottom section of the boompole is covered entirely by hand-grip material – making it easy and quick to grab.